The pre-game situation seemed to be clear: with a 3-1 victory in the first leg, Bayern were bound for the quarter-final. Bayern started the game accordingly, waiting and lined up in a 4-1-4-1. They abstained from extensive pressing and just let Arsenal play in the opening minutes. Simultaneously, Arsenal attacked early. The quick goal was on the one hand due to Arsenal’s pressing, on the other hand due to errors of the Bayern defensive line. Arsenal forced a long ball by Bayern. Ramsey got the ball in the centre when Martinez and Gustavo were at the same height instead of being slightly off each other. One slip of David Alaba did the rest. Giroud scored (3rd minute). How could Arsenal force Dante to play this long ball? 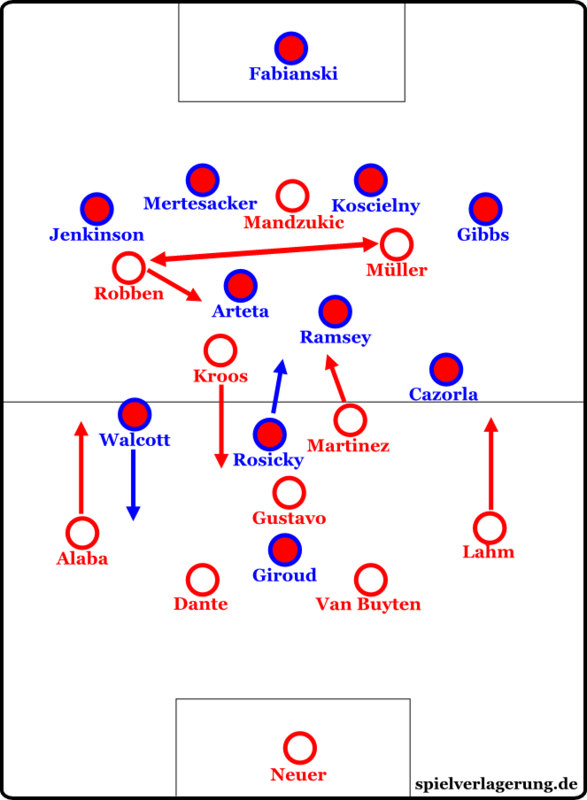 A varied pressing was the key: the English pressing switched from a 4-4-2 to a 4-3-3, depending on how high or deep Rosicky was positioned. If both Giroud and Rosicky attacked up front, they put Munich’s central defenders under pressure. This resulted in rather many long balls, in particular in the initial phase of the game. If Rosicky was positioned a little deeper (for example if he fell back in attack), Arsenal tried to gain access through the wings. areas. Gradually, the Gunners withdrew. They did not want to walk into a trap, so they lay in wait for a counterattack, trying to start quickly through the centre when possible. There, Rosicky fell back a little, and Ramsey pushed forward at the same time. From the centre they employed Walcott starting on the right – or rather, they tried to. The rapid shift from the centre to the right was clearly visible, but the passes did not come through to Walcott. Rosicky especially did not shine in ball distribution, as Martinez and Gustavo constantly tackled him. Bayern took control of the field against deep lying Gunners. Since the boys from London receded relatively quickly, the Bavarians let the ball circulate in the second and front third of the field. Since Bayern’s “engine” Schweinsteiger was missing, Kroos fell far back. He was the focal point of Bayern’s game. This meant that Martinez and Robben had to repeatedly move forward from their positions so their team had some presence in central attacking midfield. These shifts were problematic as they conflicted with the natural strengths of the Bayern stars. Toni Kroos works best as a linking player. His deep role meant that he could no longer create a connection between the different parts of the attack. Martinez and Robben could not compensate for this. At Bayern, Martinez impressed so far as the most defensively oriented player in midfield, with only carefully applied thrusts forward. He often lacked the proper timing when pushing up, so he got stuck in the covering shadow of Arsenal’s midfield. Robben also did not really impress there; central battles in close quarters are not his specialty. He needs three or four steps for starting up. Accordingly, Bayern employed little combination play to get trough the centre. High positioned Müller and striker Mandzukic were more often than not cut off. They could only excel in the game against the ball. The Bavarians often had to rely on attacks from the sides. In the first 20-30 minutes Lahm and Alaba held back, so the ball was mainly played around the centre circle. After that they began to keep going forward. Bayern came close to the box more and more often, but their crosses did not connect. After the break, the Bavarians had their best phase. Robben positioned himself wider and refrained from moving into the centre as often as before. From the wings, he was able to apply his great dribbling skills better. At the same time, this allowed the full-backs to move into the middle. Previously, they had been forced to provide width in the system. Munich’s became more varied. They made better use of the half-spaces next to the Sixes (DMs). At the same time they were able to create superior numbers on the wings. Bayern now focused on attacks via the half-spaces and the wings. They combined at the baseline to play back to the box. This tactic worked well because Arsenal’s Sixes fell back very early into the box. Robben, Kroos or Gustavo lurked on the edge of the box, one of them was almost always unmarked. However, Munich did not score. Arsenal didn’t show much. The first shot they gave after their early goal was made in the 54th minute. The first shot on goal came in the 79th minute. They often got stuck in Bayern’s counter-pressing and had to rely on long balls. Additionally, their attacking play was as mentioned above quite inaccurate, wasting good opportunities for counter attacks. They also took little risk after the goal and produced local superior numbers only on rare occasions. The full-backs in particular held back. And last but not least Bayern’s back four won decisive duels when the Gunners came through at times. Cazorla. The Gunners’ play became more fluid and less predictable. Still, there was no phase showing real English aggression. Instead, they finally made it into the final third and got more free kicks and corners. One of these corners Koscielny headed in for the 0:2. In the final minutes the Bavarians showed their experienced cool and let the remaining time go by. Almost all of the players from both teams gathered at the corner flag and tried to separate Robben from the ball. Arsenal did not come forward anymore, 0-2 it was. The last English team in the Champions League has been eliminated. Arsene Wenger’s team showed a disciplined performance. They showed their quality particularly in pressing when Giroud and Rosicky ran at Munich’s defenders. Nevertheless: at least for the moment, the top teams from the Bundesliga and La Liga remain ahead. One reason for this is the increased focus on decent pressing on the continent. Arsenal could not keep up with Bayern’s (counter-)pressing after the initial phase. And even if you have to praise the fighting spirit the Gunners showed in this game, they actually should have lost with a shot ratio of 5:23. A single shot between the 3rd and the 79th minute says it all. Bayern suffered their first defeat in 2013. The new depth of this season’s Bayern squad has been much praised. The first Champions League knockout round brings another issue to the fore: there are some players the Bayern system stands and falls with. Schweinsteiger and Ribery are two pillars of the team. Without them it is difficult for Bayern to break individually strong opponents. Those two are not only individually strong themselves. They are also a guarantee that other players can be used in their respective best roles. There is no need to speak of a major Bavarian crisis. They could have won this game as well, given the distribution of chances and shots. But still – in the up-coming weeks they need to be more alert and to combine faster. Written by TE, translated by PF. Hat natürlich nicht´s mit diesem Spiel zu tun. Ich will euch nur sagen, dass ich mich wahnsinnig über eine Analyse von Inter-Tottenham freuen würde.